The storm will complicate election planning in fifteen states, including crucial battlegrounds like Pennsylvania and Virginia. Thanks to a wave of new voting restrictions passed by Republicans, the 2012 election was already shaping up to be pretty chaotic before the arrival of Hurricane Sandy, which left 8.2 million households without power in 15 states and the District of Columbia. The good news? All of these states should have power mostly restored by Tuesday. The bad news? Many of these states will still experience the potential for serious problems, either on Election Day or the days proceeding (early voting has already begun in a number of states affected by the storm). Problems could include: electronic voting machines without power and a shortage of backup paper ballots; polling places without power, damaged or moved; voters unable to reach their polling place or unable to mail in an absentee ballot by the deadline; election administration unprepared to deal with a multitude of new, unforeseen complications. As of Wednesday, power outages were the most severe in New Jersey (2.4 million homes and businesses without power), New York (1.9 million) and Pennsylvania (1.2 million). 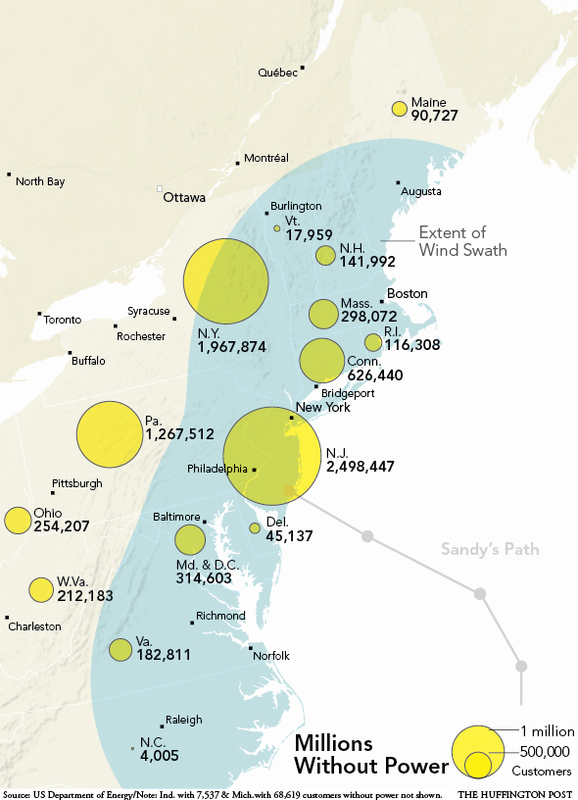 Sandy could depress Obama’s turnout in large blue states like New Jersey and New York, affecting the president’s popular vote total, while impacting the results in crucial battlegrounds like Pennsylvania and Virginia. And on to Virginia. “Nine Virginia communities—including several in Northern Virginia that were key to President Obama’s victory in the commonwealth in 2008—remained closed for in-person absentee voting Tuesday in the aftermath of Hurricane Sandy,” reported the Post. At least six states hit by the storm (Maryland, Pennsylvania, North Carolina, New Jersey, Virginia, West Virginia) use electronic voting machines with limited paper ballot backups. “In those locations, unless they have enough emergency paper ballots printed up to accommodate the entire electorate at precincts where power remains disrupted on Election Day, there could be very serious and unprecedented problems,” reports Brad Friedman of The Brad Blog. Friedman noted that in Pennsylvania, “in case of power loss, local election officials are encouraged to keep enough paper ballots on hand for 20 and 25 percent of their registered voters,” reported the Pittsburgh Post-Gazette. That seems woefully inadequate given the magnitude of the storm. States impacted by Sandy could extend polling hours on Election Day or during early voting. But any vote cast during extended hours within ten days of the election must be done via provisional ballot, notes Rick Hasen, author of The Voting Wars: From Florida 2000 to the Next Election Meltdown. In 2008, 31 percent of the 2.1 million provisional ballots cast nationwide were not counted. Hasen is urging states affected by the storm to print as many backup paper ballots as possible, open as many polling places as feasible, and ensure that all locations have power through the night. “We haven’t had anything like this in recent memory, on this scale,” he says. Regardless of who wins the election, the most important part of the electoral process is that every eligible vote is counted. The integrity of the election was already under siege due to GOP voter suppression laws. Hopefully, Sandy won’t make a bad situation even worse. For more on Hurricane Sandy, check out Michelle Dean on FEMA, inequality and the need for better government.